Hot Dog Hero is a platform game... with a twist! Instead of just jumping around on fixed platforms avoiding enemies and collecting various items, you get to control the game and draw your own platforms. This makes for endless possibilities and strategies for beating the game and getting the most points. But wait! There is a small hitch: you only have a small amount of ketchup, mustard, and mayo that you can use to draw paths, so this game is more strategic than the average platform game. 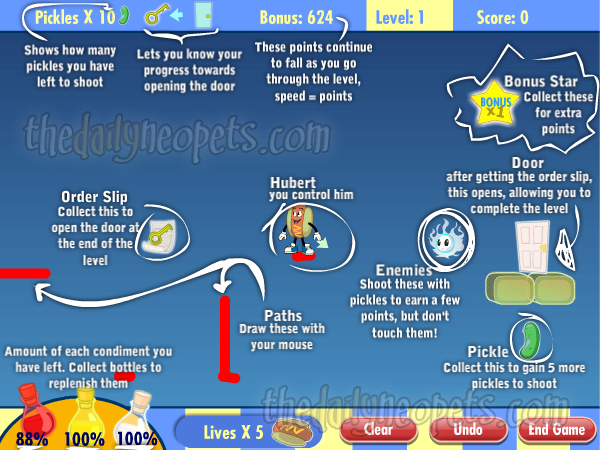 Like so many other games, you can use the left and right arrow keys to move left and right, the up arrow key to jump, spacebar to shoot (pickles in this case), and the mouse to draw your paths. Your mouse is also used to aim at enemies before shooting. Ketchup: Ketchup is quite boring actually. It has no special effects or anything. Mustard: The best condiment to use most of the time, mustard is very springy and allows you to bounce right up again instead of landing on it. All three condiments have their advantages and disadvantages depending on the situation, but they are all quite useful when used together. Bonus Stars will give you extra points. A Bonus Star that says "Bonus x1," such as in the screenshot above, will give you 100 points. Similarly, a "Bonus x2" star will give you 200 points, and a "Bonus x3" star will grant you 300 points. You can get points from hitting enemies with your pickle shooters. You get a different number of points depending on the species of enemy. There are three key things that you need to do to get the most points in this game: get the bonuses, fast, with the least amount of condiments possible. How you achieve those goals is up to you, but here are some tricks to help get you started. First, use the mustard. A great strategy that you can use with the mustard is bouncing right across the level by drawing a small mustard spot, jumping on it and drawing another spot right where you will land, flinging you back into the air again. Control where you will land with the arrow keys and use this strategy to bounce across the whole level and collect all the bonuses. Note that collecting pickles is less important. It's only worth it to get them if they are already in your path or they are very quick and easy to get. When you want to land for good, or need more control, switch to the mayo to get your bearings back and get whatever you need to get. For difficult items or enemies that are underneath a stationary block, use the mayo's glue-like ability to walk upside down under the block and get the item/enemy. If all else fails, turn your head upside down and see how you can get to it, but do is as FAST as you can! Hot Dog Hero is a quite unique game. It's quite fun and addicting, and with these tips, you'll be able to play even better and longer!